Hello and welcome to my first "Collection Commentary" post, so what is collection commentary? It is a series I've created for my blog where I'll look at a collection, illustrate my favourite pieces and basically comment on them! Simples. 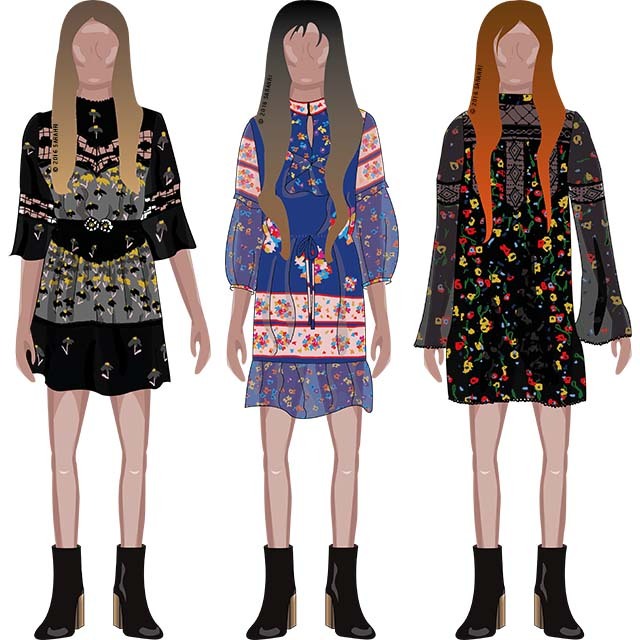 This first post looks at three pieces from Anna Sui's Resort 2017 collection. 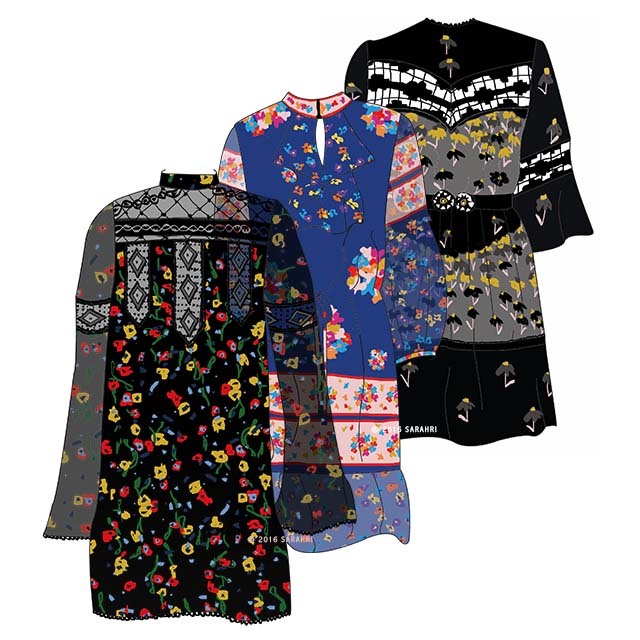 I have been an Anna Sui fan for years, in every collection there's always something that makes me go wow and deeply want, before crying that I can't afford it on my pitiful student budget. This collection seems to have quite a few vintage inspired silhouettes, while some of the lace (possibly not lace as I'm only going by what I've seen in loads of photos) and darker colours give it a bit of a grunge, young feel. The amount of lace and floaty, draped translucent fabrics in the collection reminds me of underwear like little naughty nightdresses/slips with lace trims. So why did I pick these pieces? Left: Dark with a bright floral print while retaining a bit of a grungy/edgy element with the lace, count me in. Much yes. Centre: Again I'm a sucker for a good print and I thought the pink floral/stripe parts were just lovely. Right: I love everything about this one, I think it's my personal favourite, the black and dark grey with just the right amount of yellow. I love the shape of the dress and it has lace-y stuff in all the right places. 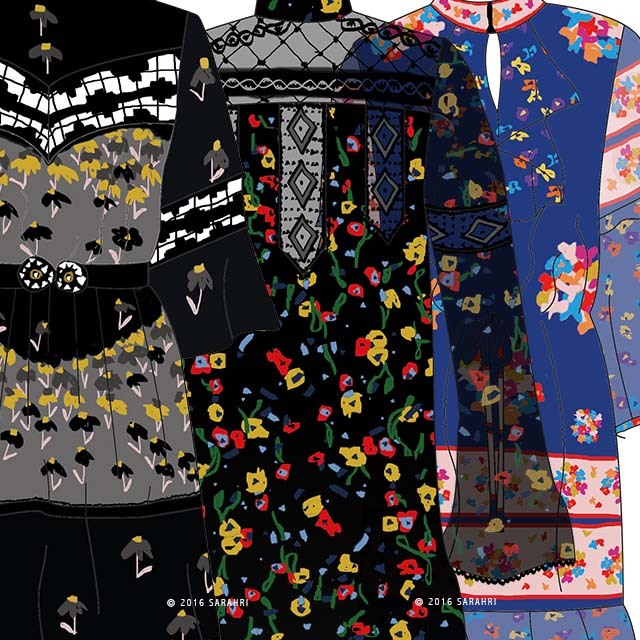 So that's my view of Anna Sui's Resort 2017, you can see the official photos of the collection on the Anna Sui website here! Hope you enjoyed, let me know your thoughts on the collection. Remember you can stay up to date with my blog by following on bloglovin. loved it. thanks, your posts are amazing.